Rebounding, also known as rebounding exercise, is a type of full-body aerobic workout with powerful detoxifying potential and lots of other health benefits. Essentially, a rebounding workout consists of special jumping movements performed on a device that looks pretty much like a mini-trampoline, officially called a rebounder. Rebounding had reached the peak of its popularity in the 80s and somewhat forgotten over the following decades. Now it’s gaining momentum once again, with fresh studies that confirm its astounding health benefits! Rebounding exercise works in two different but related ways. As a form of cardio, it strengthens the heart, lungs, and blood vessels just like running or cycling do. By increasing the activity of these organs, rebounding trains their muscular structures and improves local oxygenation. At the same time, being a special form of cardio, it also has a unique action. The repetitive acceleration change that happens during rebounding exercise helps to open the valves in your lymphatic vessels, enhancing the flow of lymph throughout the body. This helps in detoxifying your body and significantly boosts the activity of your immune system. What Makes Rebounding Exercise So Great? Perhaps, one of the most important studies on rebounding exercise was the one published in the Journal of Applied Physiology, 1980, by NASA experts. The goal of the paper was to study the distribution of acceleration throughout the body during such exercises like treadmill and trampoline jumping. The bottom line of the study basically goes like this: although the physical impact you experience during rebounding exercise is greater than when running, it is distributed more symmetrically throughout the body. During treadmill exercises, most of the pressure is placed on the ankles, while rebounding exercise distributes it evenly among the ankles, back, and forehead, thus minimizing the risk of injuries while still providing a lot of mechanical work! It’s like getting all the health benefits of usual physical exercise without fearing for the health of your joints and tendons, which is especially important for older people and for those suffering from chronic joint conditions. However, if the latter are severe, it’s still highly recommended to consult a professional before starting rebound exercise. What I love most about rebounding exercise are the detoxifying effects that you can get with the regular bouncing. It is really the most superior and the only exercise that you need to keep you healthy. And it’s easy to do! Is a low impact exercise as the trampoline absorbs most of the shock from the bouncing. Is the only exercise that cleanses and strengthens every cell in your body. Stimulates your lymphatic system for a stronger immune system. Activates production of new white cells (lymphocytes) that is your defence system for fighting illness and infections. Helps your body to eliminate toxins when lymph flow is improved. Oxygenates your body and improves blood flow. Besides being an incredibly fun thing to do, rebounding exercise also provides some serious health benefits for those who practice it. 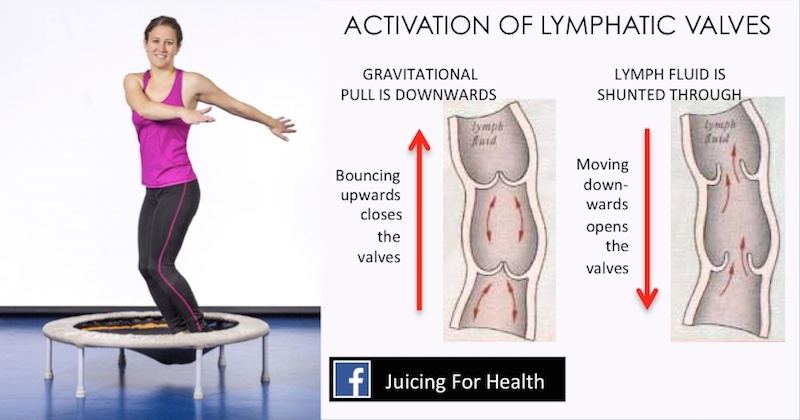 The bouncing movement on a trampoline helps open the lymphatic valves to boost circulation throughout your body. This helps to increase lymphocyte activities that improves your immune system. With just only two minutes of rebounding exercise, the movements help to flush the entire lymphatic system, while cleansing and strengthening cells and lymph nodes. During this brief time span, your white blood cells (lymphocytes) triple in number and remain elevated for at least an hour. White blood cells, or lymphocytes, are an important part of your immune system that help fight off diseases—great for preventing/recovering from illnesses. As during all other forms of cardio exercise, rebounding exercise makes your heart beat faster to provide the muscles with extra oxygen for their movement. This results in more blood being pumped throughout the blood vessels and in your lungs, breathing faster to fill the blood with oxygen. Eventually, all of these structures in your body will adapt to this kind of work and become much more stronger and healthier! Several studies indicate that rebounding helps to improve insulin sensitivity, which translates to better blood sugar levels and reduced risk of diabetes-related complications. For non-diabetics, rebounding could help to prevent the development of the condition in the first place. Being quite the intensive form of cardio, rebounding also helps to tone up the body and improve its parameters. For example, studies have confirmed that rebound exercise can improve the body’s circumferences, burn body fat, and build lean muscle mass. Additionally, the full-body detox that rebounding provides also enhances the effectiveness of weight loss. Some of the major factors that lead to the development of cellulite are slow lymph flow and local accumulation of toxins. By enhancing the flow of lymph throughout the body, it’s possible to significantly reduce cellulite after a couple months of regular rebounding! When lymph flow and blood circulation improves, it will naturally also help to reduce appearance of varicose veins. There are numerous studies affirming that jumping helps to increase bone density in men and women alike, keeping the skeleton strong and preventing bone fractures in the middle-aged and elderly. Contrary to ordinary jumping, rebounding would be a much gentler option, more suitable for people with conditions of the joints and back, for example. Thanks to the evenly distributed acceleration throughout the body, repetitive jumping movements can help to improve the body’s overall stability by training its core muscles. This shows fabulous results even in such serious conditions like spinal cord injury! Some other studies also indicate that rebounding improves balance and posture in elderly women after just 12 weeks of training. What should you wear when rebounding? Like any exercise, wear something comfortable, not tight or constricting clothings. Your “extra bits” may jiggle, but that is how it is supposed to be. Feel free and let them jiggle. Put on some fun music and have fun rebounding! Is the rebounding exercise easy to do? For a beginner who doesn’t exercise much, rebounding can initially be very tiring. Although it looks easy, jumping on a mini trampoline for two minutes may cause exhaustion as it really increases your heart rate and lymph circulation that you may not be used to. Start jumping for as long as you can manage, probably between 3 and 5 minutes. Even with this short span of jumping, you can benefit much from the exercise. The key is to be consistent and gradually build up your stamina by exercising daily as you comfortably can. How long should you use a rebounder daily? It is important to wait at least two hours from your last meal before you start rebounding. Start with 3-5 minutes daily. Eventually work your way up to 15 minutes a day, in order to enjoy all the detox and healing benefits of rebounding. How long should you rebound for weight loss? For weight loss support, rebound for between 20 and 30 minutes daily, or at least three times a week. This video below is excellent for giving you some great ideas on how to jump on a mini trampoline. Is jumping on the mini trampoline bad for your knees? Rebounding, or jumping on the mini trampoline is a very low impact exercise. Most of the shock from the jumping is being absorbed by the trampoline. It is so low impact that individuals with joint and back pain problem can safely use it at their own pace. In fact, this exercise is so great that it accelerates recovery of your joint and back pain! How to practice rebounding if you don’t have a trampoline? If you don’t have a trampoline at the moment, you can try to mimic the effect it provides by using a soft exercise mat. Perform your rebounding routine by jumping on it, just make sure that your feet barely leave the surface when you jump up. The whole point of the mat is to absorb as much of the jumping impact as possible, so thicker and softer mats would be more effective in this. On the other hand, they are also harder to jump on as they don’t provide that upward momentum a trampoline gives. Rebounding is a unique form of cardio exercise: packed with huge health benefits, it’s also extremely fun to do. Who said that trampolines are just for kids?! If you do it right, it can improve and enhance all aspects of your health mainly by strengthening your immune system and helping to flush out toxins through the improved flow of lymph in your body. Ideally, you should purchase a mini trampoline to practice rebounding. I suggest you invest in a decent, good quality trampoline as the cheaper ones tend to break easily, and may not be built with sufficient safety features. The Leaps & Rebounds Bungee Rebounder Mini Trampoline (on the right) is one that I recommend as it protects your feet, ankles and legs from slipping through between springs that can often happen to beginners. What is also important, is that this rebounder is made of smooth latex rubber that gives you a smooth bounce that is easy on the joints, safe to be used by even those with limited mobility problems.